You look like a #@$!& coyote to me! Klondike (on top) and Meg at 2 months of age prepare for the day when they will have to defend the herd. 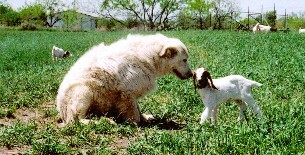 Double M Boer Goats started operations in November 1995 with a herd of 6 Spanish Goats. Within 2 months all but one had been killed by stray dogs. At that point we decided the herd would need some protection. 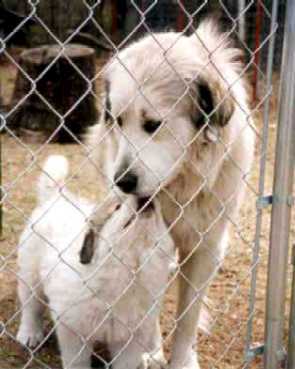 We originally purchased 3 Great Pyrenees in the spring of 1996 to guard our herd. Winnie was 2 years old at the time, and Butch and Petunia were weaning age puppies. 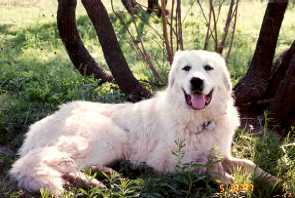 Winnie had the unenviable job of teaching the pups to be livestock guardian dogs, and did an admirable job until July 1996 when someone shot her. She is buried in the riverbank on the eastern edge of the ranch. I like to think her spirit continues to protect the herd, and guide her now fully grown and mature charges, Butch and Petunia. Since getting the dogs we have not lost a single goat to predators in the pastures they guard. Petunia died in July 2005 of cancer, she was 9.5 years old, and Butch died in October 2008, he was almost 12 years old. 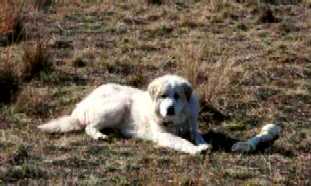 We now have 3 Great Pyrenees (1 male and 2 females) guarding our herd. Their names are: Crystal, Blue, and Meg. The last 2 are Butch and Petunia's offspring. Above Left - Winnie (the larger dog) and Petunia (the puppy) in the breeder's kennel right before we bought them. Above Top Right - Butch relaxes in the shade of a Mesquite on a pleasant spring afternoon. 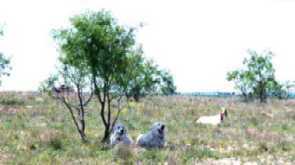 Above Bottom Right - Butch (right) and Petunia (left) guard the herd from the scant shade provided by a small mesquite near the ranch entrance. 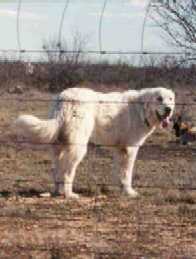 Concho Queen, one of our fullblood Boer does, rests in the pasture behind them. Below Left - Marla with Petunia in one of the breeder's pens right after we decided to buy her. Below Right - Petunia on her first Christmas eve. Less than a month later she would give birth to her first puppy. 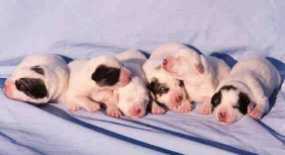 Above Left - Petunia's first litter consisted of one very large puppy. 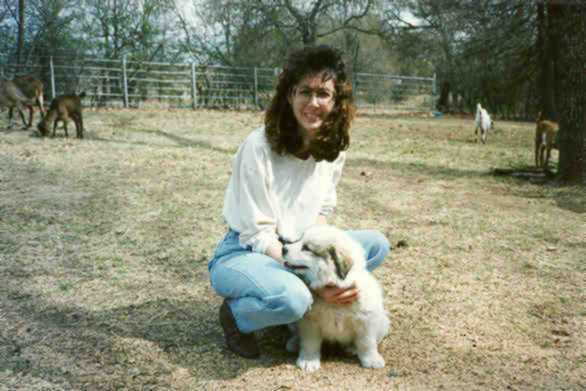 She delivered in January 1997, and we named the puppy Buster because he had a dark patch around his right eye. 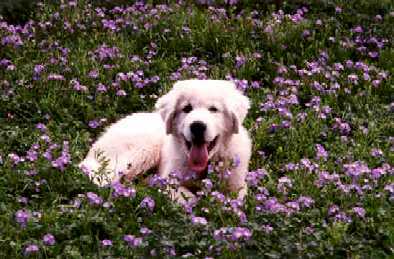 At the age of 3 months Buster enjoys the carefree pleasures of playing in a bunch of wildflowers. Above Right - Buster, now fully grown, takes his guarding duties very seriously. He will even keep strange goats away from "his" herd unless you introduce him to them first. Below Left - Petunia's second litter was born in June 1997. 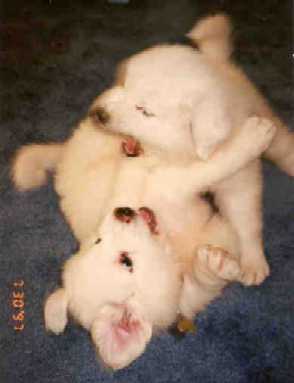 We kept the 2 solid white puppies, and named them Klondike and Meg. We eventually sold Klondike. Below Right - Petunia's third litter was born in December 1997. 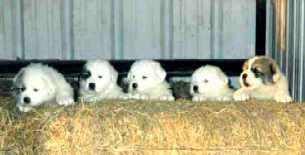 We kept the solid white puppies in the center of the picture, and named one Violet and the other Blue. After this litter was born we moved Butch to a different pasture to give Petunia a much deserved rest. We eventually sold Violet. Above Right - Crystal is very gentle and affectionate with the curious little goats.